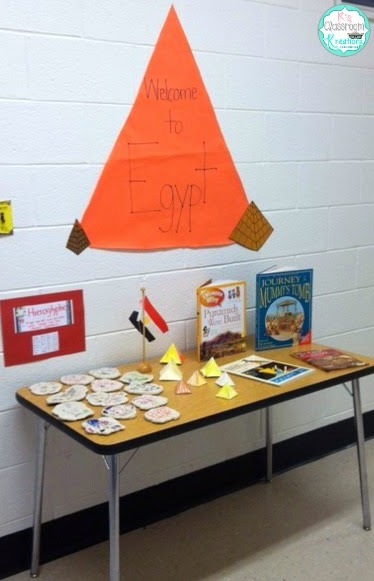 Each year my school has Global Night where every class learns about a different part of the world and shares this information with families and classmates. My first grade team combines this event with our Cinderella unit. 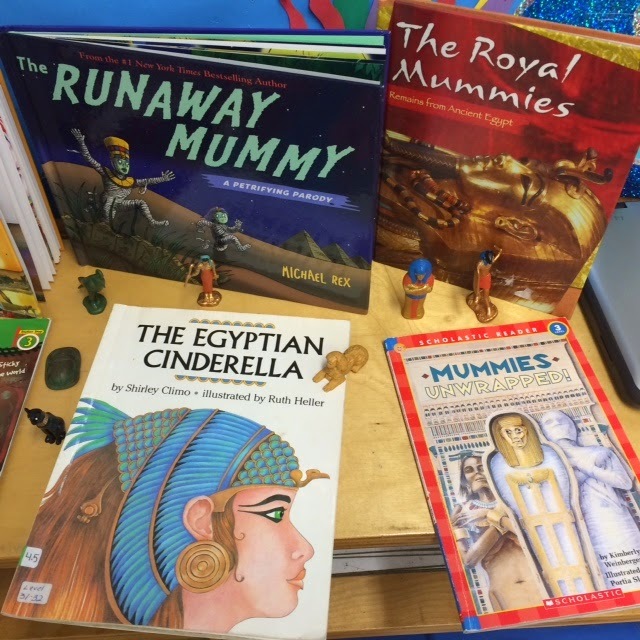 My class is reading Egyptian Cinderella so naturally, my kiddos are loving learning about Egypt! 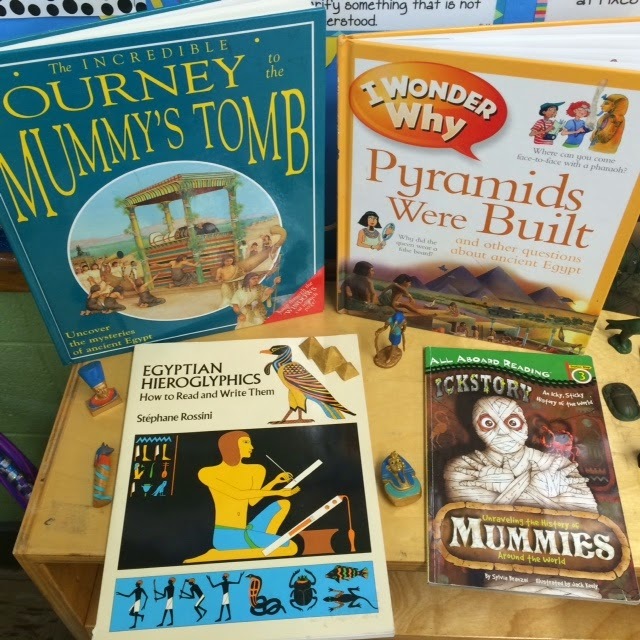 We started by reading lots of informational books about Egypt. We used this great video clip from YouTube and founds tons of others on United Steaming (Discovery Education). We loved going on these virtual tours. We found this great online game with tons of information too! My craft store shopping addiction came in handy when I scored these super adorable figurines! I love how the little 3-D toys give my firsties a better understanding. We made a different project each day to display at our Global Night. One day we created stone tablets following this recipe (salt and sand dough) and allowed it to harden overnight. The dough didn't quite turn out right (had to use sandbox sand..oops) but the kids still enjoyed it. 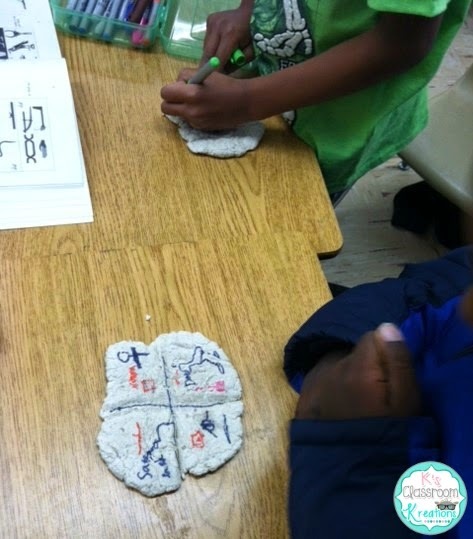 We then learned about hieroglyphics and practiced writing our own on the dough with permanent markers. 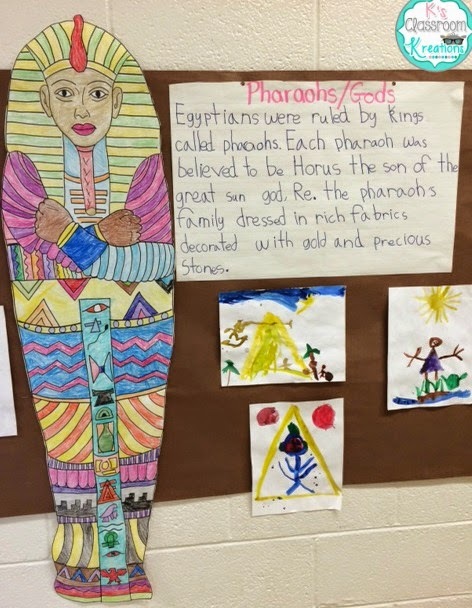 After learning about the clothing and jewelry many of the Pharaohs wore, we created our own. I used this crown template and students could choose the version they liked best. 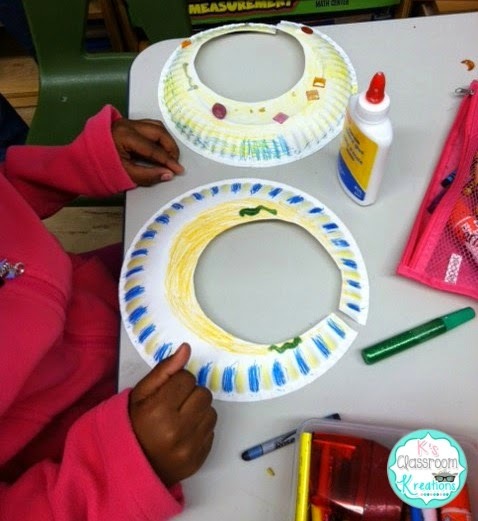 We also created large neck pieces by cutting the center out of a regular paper plate. 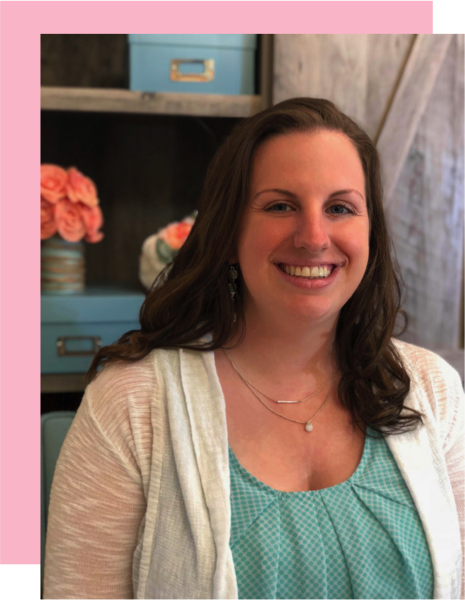 This blog post was my inspiration and includes step by step directions. We added glitter glue and sparkles to spice them up! 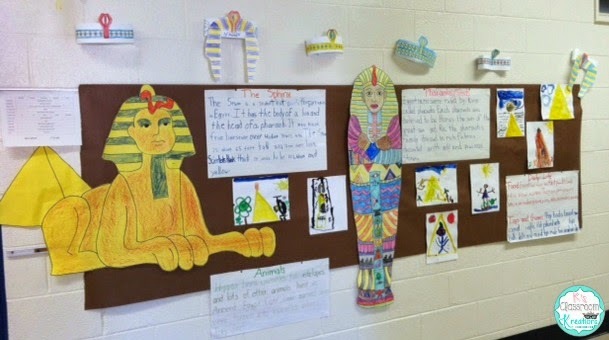 After we were all experts on Ancient Egypt I divided everyone into partners. Each pair used chart paper to write a paragraph about their topic. They did so well! 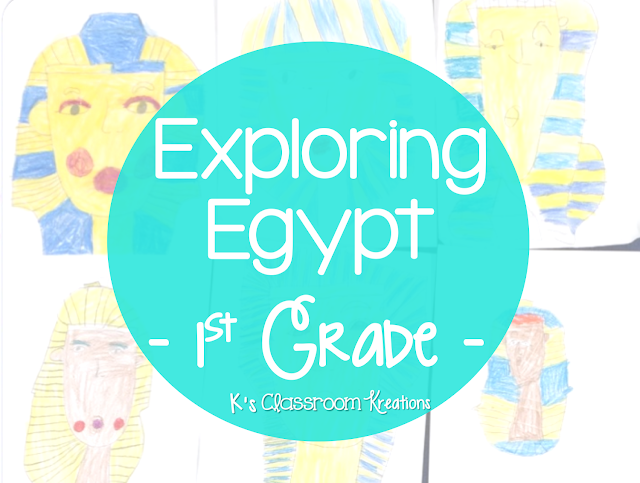 Some of our topics included Pharaohs, Animals, The Sphinx, Pyramids, Mummies/Tombs, Hieroglyphics, and the Nile River. 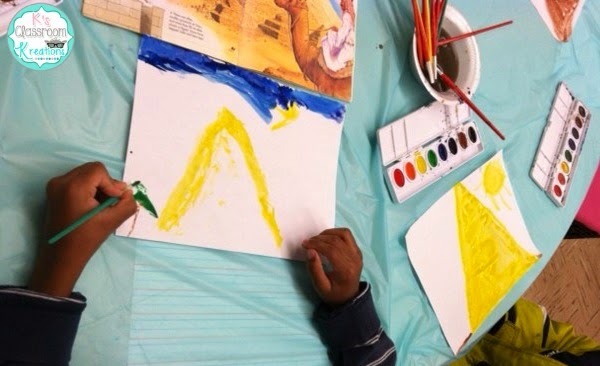 Now like I tell my students, I went to teacher school...not art school. So, I had to improvise. 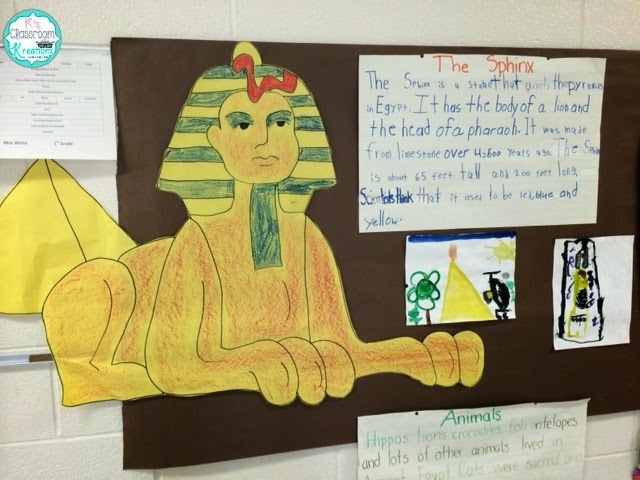 I found a black and white line drawing (like a coloring book page) of the Sphinx and a Sarcophagus. I copied and pasted the image into a smartboard file and froze the screen (so I wouldnt keep moving the image or clicking the wrong buttons). I taped large white bulletin board paper to the board and simply traced each image. Kids then worked to color in each part. Seriously, it was like a life sized coloring book and they were ALL about it. 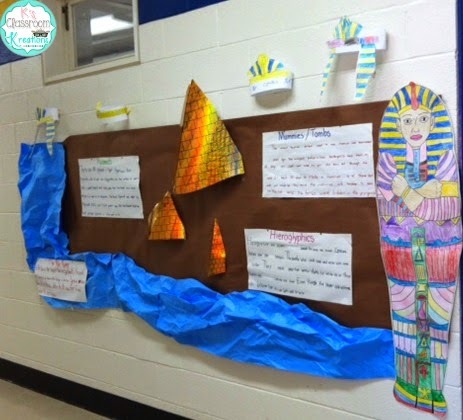 We then took our finished art pieces, chart papers, and decorations and hung them in the hallway. I found some cool shiney paper at the craft store to create 3-D pyramids to pop off of the walls. 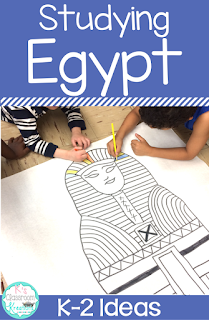 We had so much fun learning about Egypt! For added fun, I suggest this Ancient Egypt music video- my kids cracked up! Do you have Global Night at your school? What is your favorite place to learn about?